Feng shui is the ancient Chinese art of placement, a practice aimed at creating a healthy energy flow throughout your home and establishing the foundation for a balanced, harmonious life. It is no surprise that the kitchen plays an especially important role in feng shui. The location, design, and feng shui basics of your kitchen are all considered very important in an overall good feng shui floor plan. Your kitchen is part of the so-called "feng shui trinity" of your home—the bedroom, the bathroom, and the kitchen—and each is considered to be of the utmost importance for your health and well-being. Obviously, your ability to create a perfect feng shui floor plan is limited unless you are building a home from scratch and can position each room and all the windows and doors precisely where you want them. In an established home, you'll need to work with the existing energy flow patterns, enhancing the positives and seeking "cures" for any negative energy tendencies that are present. When you are building a home from scratch, though, or when you are undertaking a major remodeling project, you may have the luxury of choosing the position of the kitchen—as well as the other rooms—precisely where you want it within the overall floor plan. Here are some things to keep in mind when working with the position of the kitchen for a good feng shui floor plan. Often, this means avoiding certain pitfalls that hinder feng shui energy flow. The worst feng shui positioning of a kitchen is one in which the front door enters directly into the kitchen, and the kitchen is the first space viewed. This applies only to a floor plan where you literally come into the home through the kitchen; it does not apply when the kitchen is set back further in the floor plan and is partially seen from the front entrance. When this unfortunate floor plan is unavoidable, there are still better and worse scenarios. An oven that you can see from the front door, or which is aligned with the front door, is considered the worst feng shui. It is a bit better if you're presented with a nice view of your kitchen, such as a kitchen island with some flowers or a little herb garden on it, which can tip the balance toward better feng shui. 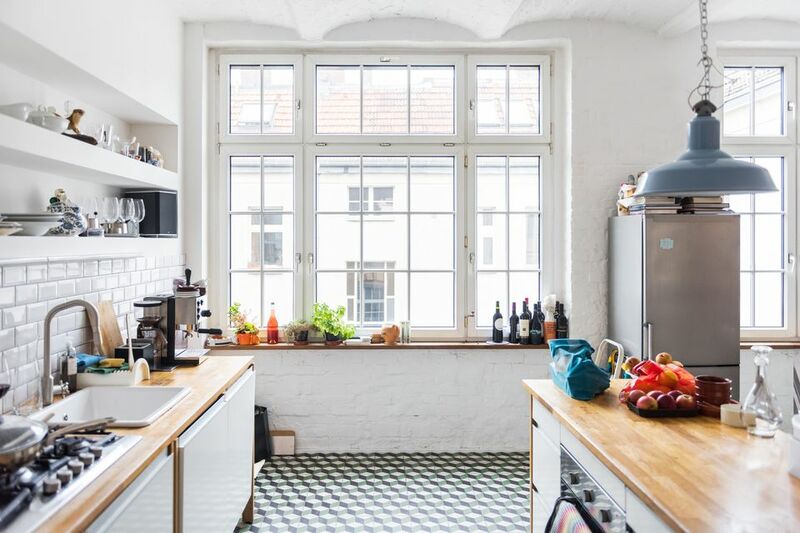 If you want to try to remedy the feng shui of a bad kitchen layout, especially since it is hard to move a stove, you can explore various ​feng shui cures. Another bad feng shui location of the kitchen is either under the bathroom or facing a bathroom door (a bathroom door in proximity to the oven or kitchen island is the worst). The reason here involves plain common sense (and scents) since you do not want the odors of the bathroom to mingle with the aroma of food. Also, since the kitchen is a place where fire energy feeds the home, you do not want that energy to directly flow out through the bathroom, which is considered a place of exit. Finally, the bathroom is considered a water element that directly competes with the fires of the kitchen and can douse the flames. A kitchen very close to the staircase. These two energies are opposite each other and are best kept at a distance. There are several elements that are important in the actual design of the kitchen. A good feng shui rule of thumb for the layout of a kitchen is to follow the classic kitchen triangle principle, where the oven, the refrigerator, and the sink form a work triangle. This principle of good feng shui is well known and used by most kitchen designers, whether they are feng shui practitioners or not. A lesser-known principle, but one very important for feng shui, is to avoid having your oven positioned so that you cook with your back to the door.